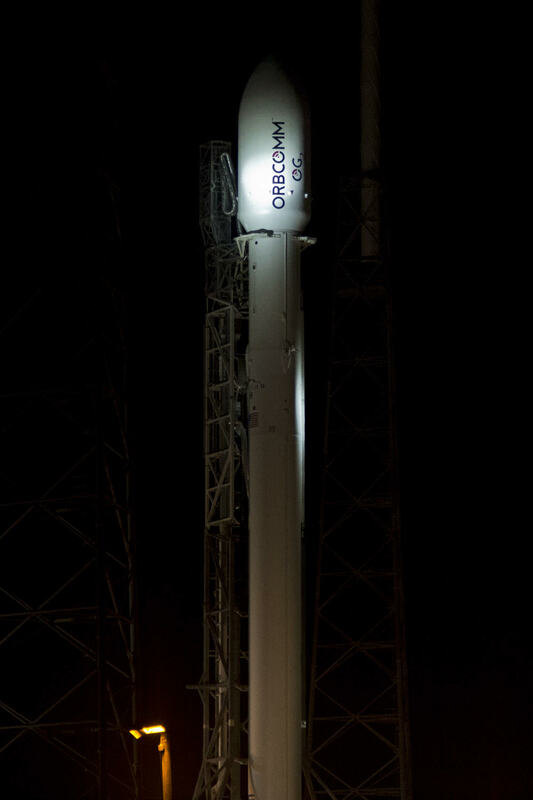 A SpaceX Falcon 9 rocket was rolled out to its Florida launch pad early this morning at 1 a.m., Friday, June 20, in anticipation of blastoff at 6:08 p.m. EDT this evening on an oft delayed commercial mission for ORBCOMM to carry six advanced OG2 communications satellites to significantly upgrade the speed and capacity of their existing data relay network, affording significantly faster and larger messaging services. The Falcon 9 rocket is lofting six second-generation ORBCOMM OG2 commercial telecommunications satellites from Space Launch Complex 40 at Cape Canaveral Air Force Station, Fl. Update (6/23): The Saturday launch was scrubbed due to 2nd stage pressure decrease and then was scrubbed on Saturday and Sunday due to weather and technical reasons. 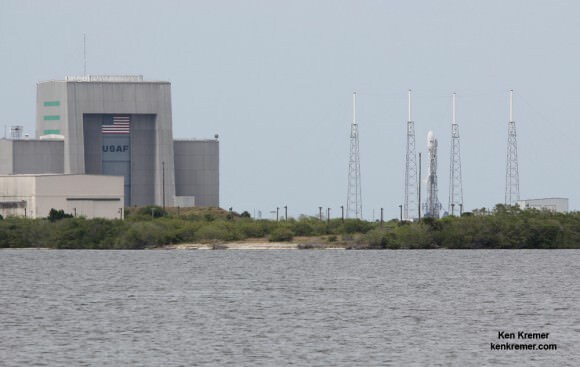 SpaceX must now delay the launch until the first week in July because of previously scheduled maintenance for the Eastern Test Range, which supports launches from Cape Canaveral Air Force Station. This also allows SpaceX to take “a closer look at a potential issue identified while conducting pre-flight checkouts during [Sunday’s] countdown,” the company said in statement on its website on June 23. The next generation SpaceX Falcon 9 rocket is launching in its more powerful v1.1 configuration with upgraded Merlin 1D engines, stretched fuel tanks, and the satellites encapsulated inside the payload fairing. Falcon 9 will deliver all six next-generation OG2 satellites to an elliptical 750 x 615 km low-Earth orbit. They will be deployed one at a time starting 15 minutes after liftoff. The first stage is also equipped with a quartet of landing legs to conduct SpaceX’s second test of a controlled soft landing in the Atlantic Ocean in an attempt to recover and eventually use the stage as a means of radically driving down overall launch costs – a top goal of SpaceX’s billionaire CEO and founder Elon Musk. 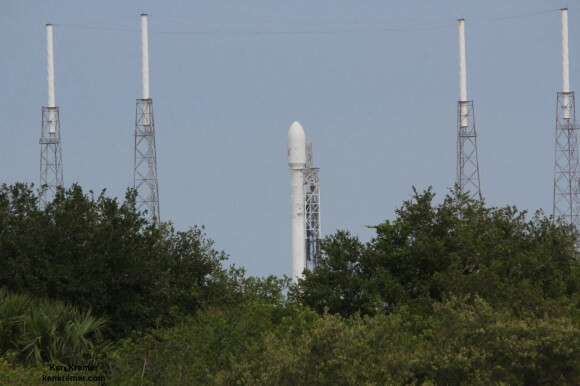 The launch has been delayed multiple times from May due to technical problems with both the Falcon 9 rocket and the OG2 satellites. The May launch attempt was postponed when a static hot-fire test was halted due to a helium leak and required engineers to fix the issues. 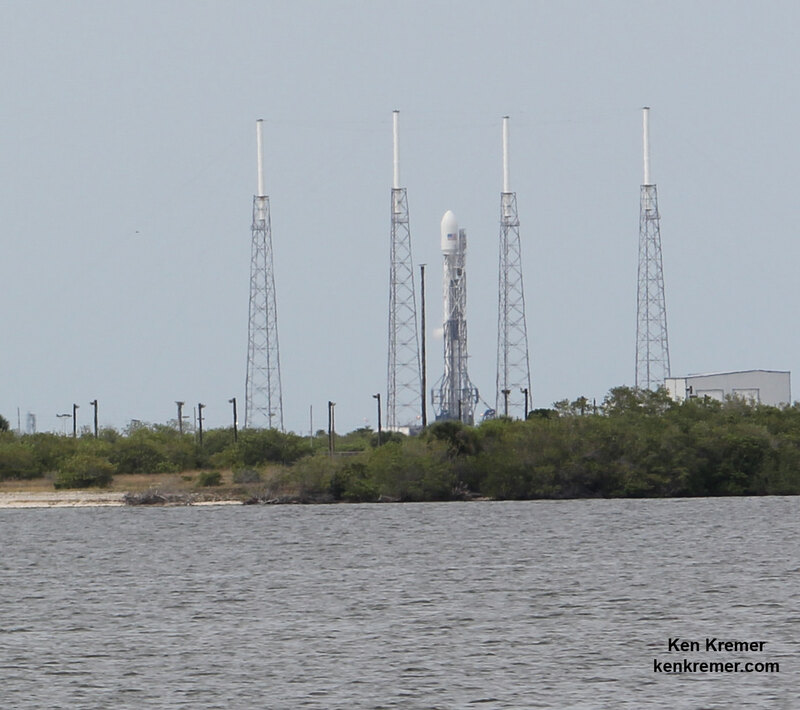 Last week on June 13, SpaceX conducted a successful static hot-fire test of the 1st stage Merlin engines (see photos above and below) which had paved the way for blastoff as soon as Sunday, June 15. 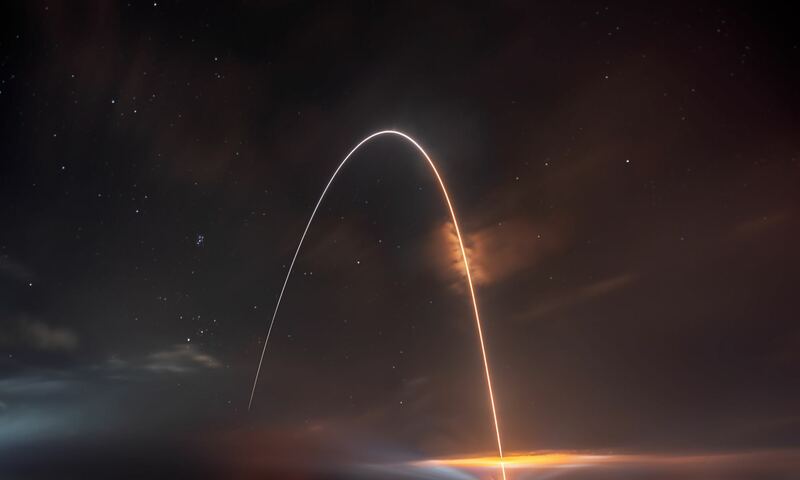 However ORBCOMM elected to delay the launch in order to conduct additional satellite testing to ensure they are functioning as expected, the company reported. “In an effort to be as cautious as possible, it was decided to perform further analysis to verify that the issue observed on one satellite during final integration has been fully addressed. The additional time to complete this analysis required us to postpone the OG2 Mission 1 Launch,” said ORBCOMM. You can watch the launch live this evening with real time commentary from SpaceX mission control located at their corporate headquarters in Hawthorne, CA. Watch the SpaceX live webcast beginning at 5:35 pm EDT here: www.spacex.com/webcast. The six new satellites will join the existing constellation of ORBCOMM OG1 satellites launched over 15 years ago. The weather outlook is currently not promising with only a 30% chance of favorable conditions at launch time. The launch window extends for 53 minutes. The primary concerns according to the USAF forecast are violations of the Cumulus Cloud Rule, Thick Cloud Rule, Lightning Rule, Anvil Cloud Rule. In the event of a scrub, the backup launch window is Saturday June 21. The weather outlook improves to 60% ‘GO’. Fueling of the rocket’s stages begins approximately four hours before blastoff – shortly after 2 p.m. EDT. First with liquid oxygen and then with RP-1 kerosene propellant. Each of the 170 kg OG2 satellites was built by Sierra Nevada Corporation and will provide a much needed boost in ORBCOMM’s service capacity. 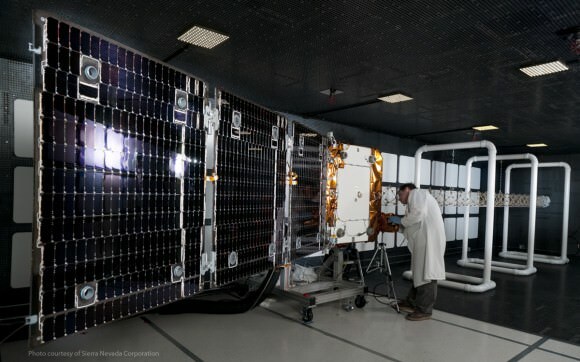 10 more OG2 satellites are scheduled to launch on another SpaceX Falcon 9 in the fourth quarter of 2014 to complete ORBCOMM’s next generation constellation. “ORBCOMM’s OG2 satellites will offer up to six times the data access and up to twice the transmission rate of ORBCOMM’s existing OG1 constellation,” according to the SpaceX press kit. The next generation Falcon 9 is a monster. It measures 224 feet tall and is 12 feet in diameter. Stay tuned here for Ken’s continuing SpaceX, Boeing, Sierra Nevada, Orbital Sciences, commercial space, Orion, Mars rover, MAVEN, MOM and more planetary and human spaceflight news.